Too big a crowd if they hold it on Tuesday, I think, with the weather. 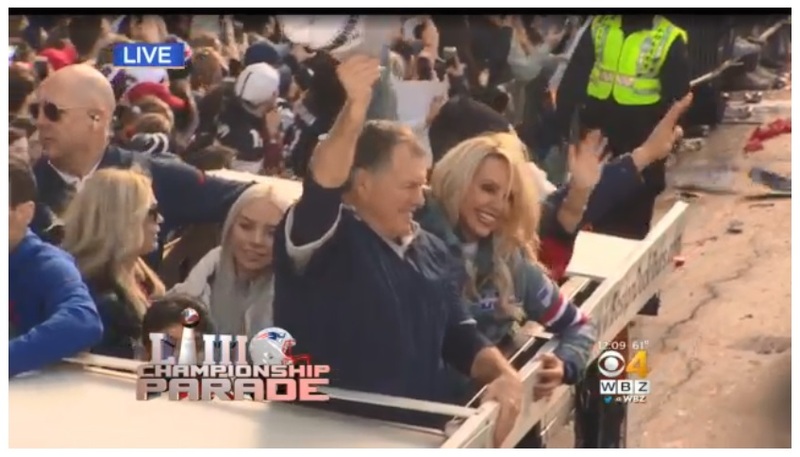 The team website — Patriots.com — will be streaming the video starting at 11. By the way, based on the crowds at 9am near Park St. station, this is going to be packed. Makes sense for a bizarrely warm day (temps will be in the 50s). Seems like a lot of HS students skipped class today, and there’s already chanting and footballs being thrown around. Lame that there will be no rally, just the parade. Best part was by far seeing the players address the crowd from Gov't center. Also judging by the commuter rail this AM the parade will be 75% HS kids and younger. Wait, why no rally? What? Brady on @MutCallahan says he told Gronk, "If you or Julian's shirt isn't off by the second block, I'll be disappointed." Yeah that's the first I've heard that. I'm pretty sure the plan was to have a rally at Govt. Center. I'm at work do you have a link for this change? It was on the news this AM, Marty Walsh said no rally didn't want to overwork the people responsible for security. Something like that. 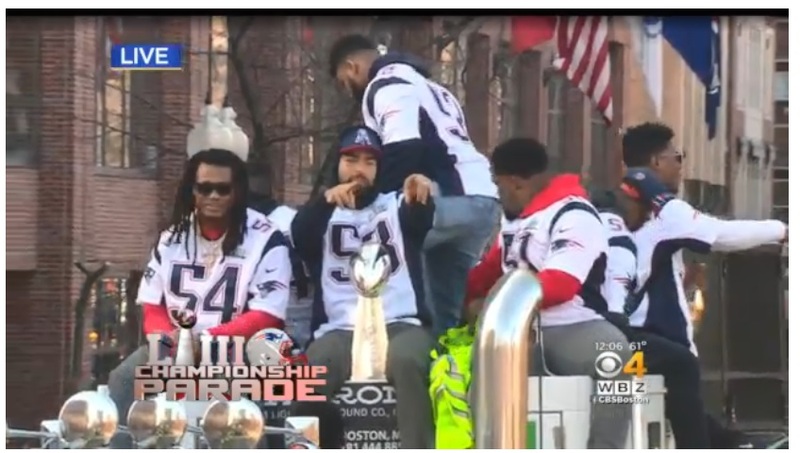 Note that there will be no rally this year, Mayor Marty Walsh said during a Monday afternoon press conference ahead of the parade. Huge delays on the train, radio said that somebody died on the Norwood Depot station this morning around 9AM. On phone, can't link. 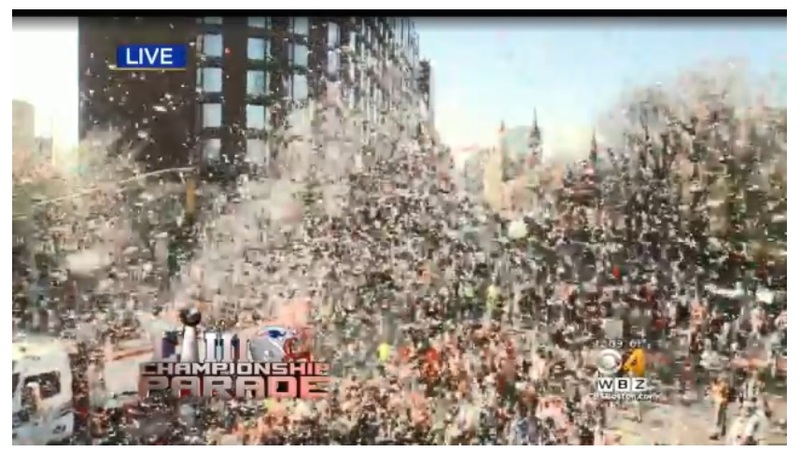 This is the first time in this run, for any of the teams, I've been able to enjoy the parade stream live. Always been work, school, college all of the previous 11. The absolute cherry on the sundae. Jared is Goffing today. This is better! Why do I want to punch Jonathan Kraft in the nose? All Cassius Marsh sees is a bunch of guys having no fun. Did Gronk have a bottle of Red wine in his hand there? I hope I saw that correctly. Just coming here to ask the same thing. What pairs well with the bud light and fireball shots he'll be drinking in a couple of blocks? Looks like the dilly dilly guy on a boat as well. NFL Network if you haven’t been answered yet. Gronk drinking wine out of a bottle. The WBZ folks were on a bit and they were the best, although I like Giardi fine too. No speeches today. Been there, done that, but I wouldn’t have minded a couple or three. 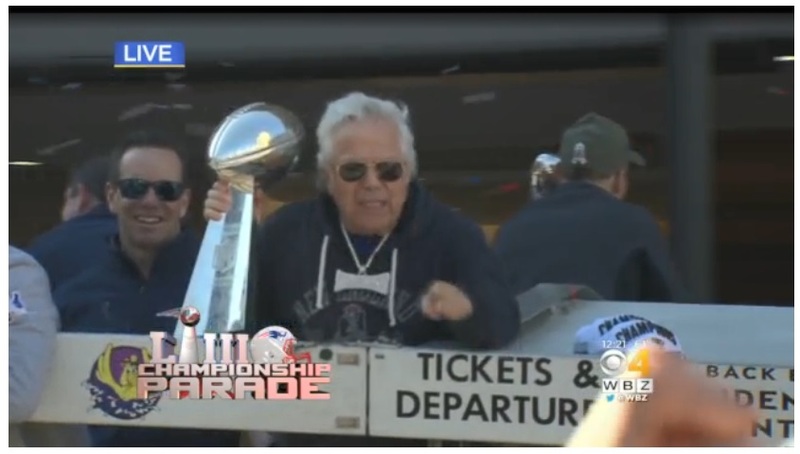 Kraft getting in more thank yous than Goff's number of wobbly duck passes on Sunday. Tom flashing zeroes with each hand between forefinger and thumb. How much did Canada Goose pay for him to wear that vest? Elandon holding a "Max Kellerman: Haterade of The Year" sign with Max wearing a clown nose. Pretty good stream for anyone looking. 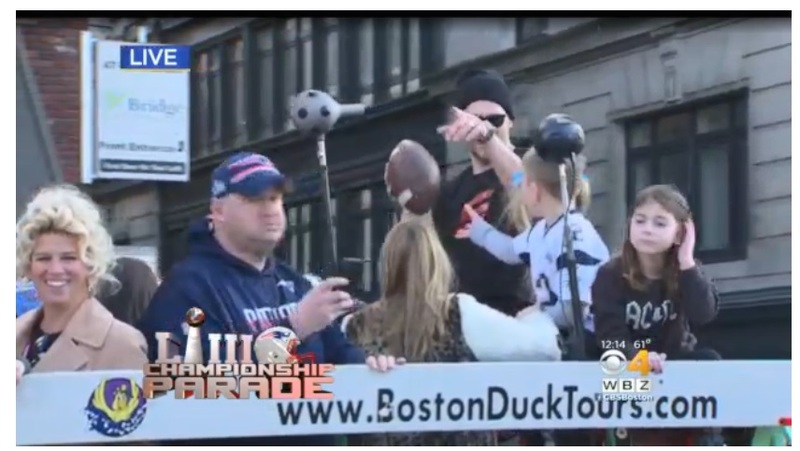 At least the Duck Boats are moving much slower for Pats than they did Sox. 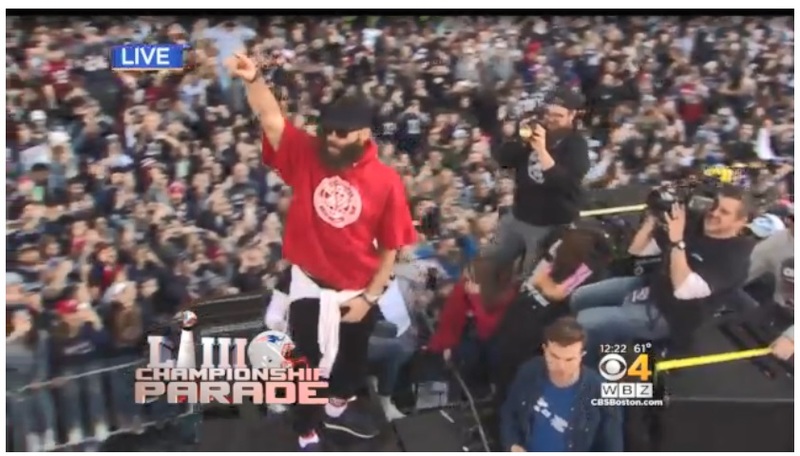 Sox parade was over in under 1:30. I can't tell if Bill looks a bit overwhelmed or dismissive! Boston has so many of these that they can learn and tweak from the earlier ones. Really ridiculous. The Brady kids are getting an education today. 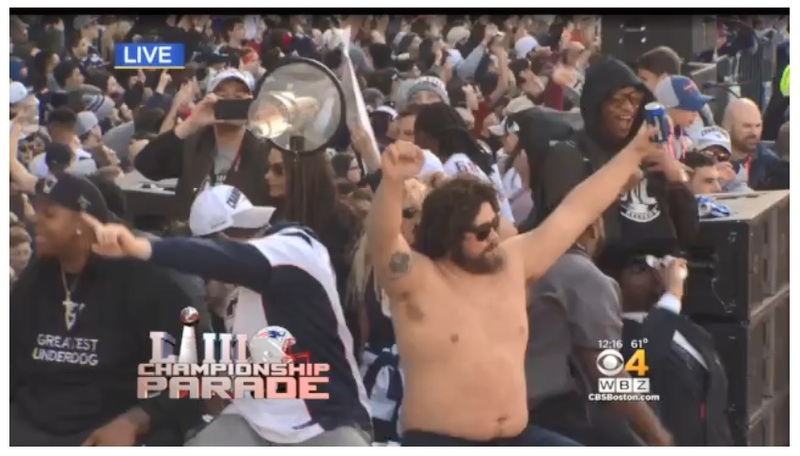 Shirtless David Andrews for the win. Who wouldn't want to have a beer with that guy? The Renaissance of Kyle Van Noy has been mostl unexpected, but welcome. 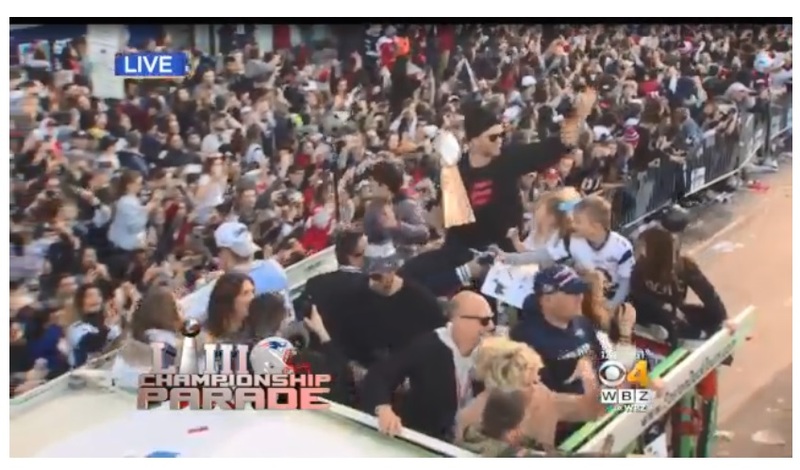 All the players on Gronk’s boat now shirtless. Van Noy is about one more season from being considered a superstar in New England. God he's great. RBs in their boat all shirtless. He is the new Vrabel, the new Nink. Cast off and has become a stud. Gonk with a handful of his girlfriend and some Tide Pods. McCourty Twins should sell the rights to their story to Disney.